As early as 1902, Tacoma businessmen had tried to interest the U.S. War Department in establishing a federal military post in the American Lake-Nisqually Plain area. At the time, however, the Army was more interested in a site in the Spokane Valley. Major General Arthur Murray and a party of Army officers visited the prairies and timberland south of Tacoma in 1912 and recommended the area favorably as a potential military reservation. General Murray said, “There is no finer Arm y post site anywhere in the U.S. In this area there is every physical condition desirable for Army training and maneuvers.” State troops used the Lewis area in 1915 for exercises involving the deployment of a regiment. The area was called Jackson’s Prairie, and many Tacoma and Pierce County citizens revived the idea of building an Army post near American Lake. No one person can be given credit for this idea. Frank S. Baker, publisher of The Tacoma News and Tribune, was one of the leaders in this movement. The Chamber of Commerce was interested in establishing a post at American Lake. Other citizens and organizations recognized the value of an Army post near Tacoma. General Bell met with the Tacoma group and discussed how to acquire the land and the War Department’s approval. In August 1916, the U.S. Senate had passed a military bill that permitted the Secretary of War to accept donated lands suited to military purposes. The land could be acquired by purchase through a bond levy by the Pierce County electorate, but first the War Department had to be convinced of the desirability of building on the Nisqually Plain. A group of Tacomans comprised of Stephan Appleby, Jesse O. Thomas, and Frank S. Baker (and Baker’s uncle, an Ohio newspaperman who knew his way around Capitol Hill) went to Washington, D.C. At the War Department the Tacomans argued their way past the Chief of Staff, General Hugh Scott, who didn’t approve of the site, and into Secretary of War Newton D. Baker’s office. Speaking for the citizens of Pierce County, they offered to donate 140 square miles to the Army if a permanent military installation were established. Secretary Baker, one of the era’s leading proponents of military preparedness, took the matter to the White House. The proposal was presented to President Wilson, who added his endorsement. Now the voters of Pierce County had to be convinced of the worthiness of the project. General Bell, Stephan Appleby, Frank S. Baker and others stumped the county. Their selling arguments were the economic benefits of having an active military post garrisoned by thousands of soldiers and their families, and military preparedness. The first argument’s validity is obvious –building materials, labor and foodstuffs for the new post would be contracted on the local economy, and this was only the beginning. The second argument had to be taken in context with the times to understand its validity and effectiveness. While the Tacoma businessmen were pushing the Nisqually Plain as a site for a military post, General John J. Pershing was leading a punitive expedition into Mexico to stop General “Pancho” Villa’s raids against American property in Texas and New Mexico. The Washington National Guard was sent to California for border patrol duty. But “military preparedness,” popularized by muckraker Hudson Maxim’s book, Defenseless America, and the film, “The Battle Cry of Peace,” expressed a legitimate concern for America’s ability to defend herself if she were pulled into World War I. Parades, speakers, pamphlets, and films were no threat to the Central Powers of Germany, Austria-Hungary, and Turkey. But, a well-planned fort in the Northwest could effectively receive, equip, and train levies raised in the western states if war came. Germany’s policy of unrestricted submarine warfare (in 1915, 1916, 1917, the liners Lusitania, Housatonic, Algonquin, City of Memphis, and Illinois were torpedoed and caused public indignation reminiscent of the Maine explosion) was putting U.S. public opinion on the side of the Allies. These were events that shaped the arguments of the men who wanted a fort on the Nisqually Plain. On 6 January 1917, 86 percent of the Pierce County Electorate voted to bond themselves for 20 years for $2,000,000 to purchase 70,000 acres to be donated to the federal government for use as a military base. Before the County could actually acquire the land in question, the United States entered World War I. An arrangement was made with the owners of the land that the County would take possession and the landowners would be paid after completion of the negotiations. Construction of the new Camp Lewis was begun before legal action started, and these proceedings were not completed until after the end of the war. The people worked night and day for two weeks to get title to 6,000 acres so the Army could begin construction on the cantonment. Camp Lewis was the first military installation in the history of our nation to be created as the direct result of an outright gift of land by citizens themselves. 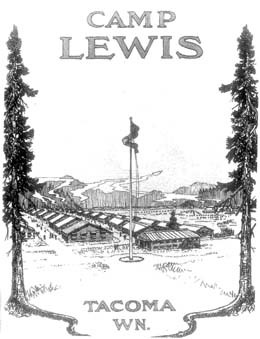 Camp Lewis officially passed out of the hands of Pierce County and the State of Washington on 15 November 1919. It became the property of the United States Government when the deed for 62,432 acres was recorded in the County Auditor’s Office in Tacoma. The deed provided that in the event the United States should ever cease to maintain the tract for the uses named, title to the land would revert to Pierce County without further act. On 3 April 1917, Captain Arthur B. Ehrnbeck arrived at American Lake with a survey party consisting of Lieutenants Scott, Gross, and Bonfils. Originally, the War Department, on the advice of Major General Bell, had intended that the cantonment be built on the north side of the lake. However, the surveyors found drainage better on the south side, and that site was selected. General plans for national Army cantonments were developed by the War Department. Design and general construction details were all standardized. It remained for the engineers to arrange those buildings on the terrain to yield the barracks, administrative, and support structures to house the required number of men, horses, and equipment. The general “u” shape that main post Fort Lewis now has is very similar to the WWI cantonment. It was two large rows of built-up area following the base of low hills to the north and south of a central parade ground with a closed end to the west, near the DuPont train station. The area occupied by the present parade ground, school, stadium, and Gray Army Airfield was the drill and maneuver area. It was this flat, gravelly plain at the present site of North Fort Lewis and main post that had attracted the military planners. Its ability to absorb rain without getting muddy appealed to them, at a time when most military training consisted of drill. Captain David L. Stone of the Quartermaster Corps arrived to supervise construction of the camp on 26 May 1917. The contract was signed with Hurley-Mason Company of Tacoma on 14 June, and construction began on 5 July 1917, seventy-six years to the day after Commodore Wilkes’ crew had celebrated the Fourth of July. The first building was finished in three days. In 90 days some 10,000 men built 1,757 buildings and 422 other structures, lighted, plumbed, and heated. Streets, roads and railroad spurs were underway. The camp stood ready for its planned 50,000 men. The first was Colonel Peter W. Davison, Commander of the Depot Brigade, and his driver, Private Herbert W. Hauck, a draftee. When the buildings were completed, the workers subscribed $4,000 to build the main gate, which is still standing. The arch was built of field stone and squared logs resembling the old blockhouses, which stood in the Northwest. The gate originally stood on Lewis Drive, roughly across Interstate 5 from the present Fort Lewis Military Museum. It was moved in 1957 when the highway was improved. General Orders Number 95, 18 July 1917, declared the National Army Camp at American Lake, Washington, to be named Lewis, in honor of Captain Merriwether Lewis, Commander of the Lewis and Clark Expedition. Camp Lewis was the first National Army cantonment for draftee training to be opened. The first recruits arrived at Camp Lewis on 5 September 1917 and 37,000 officers, cadre, garrison, and trainees were on post by 31 December. Camp Lewis was the largest military post in the USA at the time. Camp Lewis was a scene of building construction and road scraping, amidst the tumult of recruits learning close-order drill and machine gun training; the sound of hammers and of 1903 Springfields being fired on a 200-point rifle range; the laying of a spur line for support trains; and of horse-drawn field artillery training in columns. An example of the pride that Tacomans took in the post was the largest flag ever to be flown, which was bought by popular subscription by readers of the Tacoma Daily News for Camp Lewis. The flag measured 60 by 90 feet and weighed 257 pounds. It was finally flown December 7, 1918, after two unsuccessful attempts to raise it earlier that year. The weight of the flag had broken the original pole. The flag eyes tore off the halyard on the second try. The second pole rose 200 feet tall and had a four-foot ball at the top. Above this was a 20-pointed star. A race for time ensued–the Army had only 25,000 regulars in 1917 and needed thousands more to fight in France. The “Draft” was revived and many men, levied from Washington, Oregon, California, Idaho, Utah, Nevada, Wyoming and Montana, would have to be inprocessed, clothed, armed, and trained. The 91st Infantry Division (“Wild West” Division – battle cry: “Powder River! Let’er Buck!”) trained at Camp Lewis from 5 September 1917 until it shipped out, on 21-24 June 1918, for France, where it served with distinction. The 13th Infantry Division was organized at Camp Lewis in 1918 and was training in trench warfare when the Armistice was signed, 11 November 1918. The “war to end all wars” was over but the construction at Camp Lewis would continue until November 1919.